Anyone who has ever attempted to learn the Chinese language can attest to the fact that it’s not an easy task, which is why Monash University in Australia has created a virtual world that allows both online and on-campus students to practice speaking Mandarin Chinese. With the help of avatars and real-life scenarios, as we all know, virtual worlds are an immersive and interactive three-dimensional computer-generated environment that enables us to seamlessly move about in cyberspace performing certain actions. In other words, it offers tremendous potential for students to learn by doing. 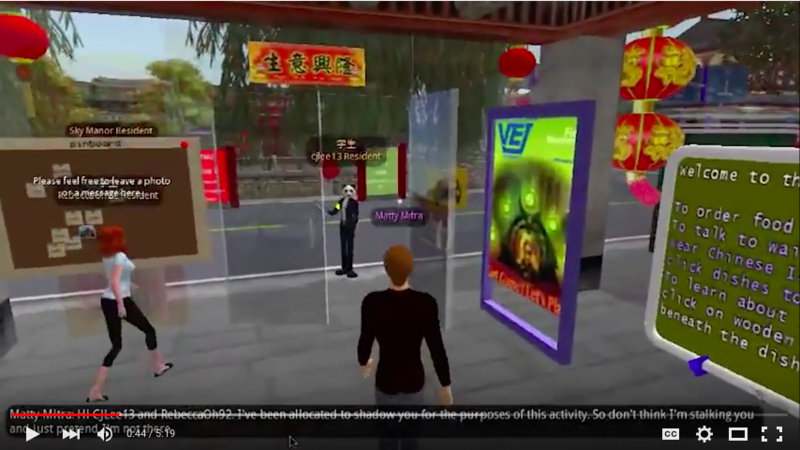 So it’s no wonder that Scott Grant, at Monash University, turned to Second Life as a way to develop a virtual Chinese language practice field using real-world scenarios straight out of the textbook. 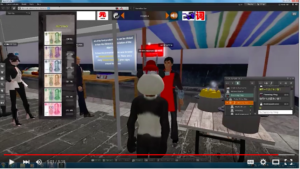 Like preparing dumplings in a virtual kitchen, they scripted a series of interactive instructions and responses in Mandarin Chinese for the avatars that they have created that requires students to put their newfound language skills to work. To make the tutorial more challenging, students are divided into pairs with one who is physically in the classroom and one in the virtual world with the instructor available in both. What’s more, they can communicate with each other via voice and text and with the avatars via Chinese character text chat. Once the activity begins, students role-play the scenario using a wide range of vocabulary and phrases they have learned in class to perform a sequence of tasks. 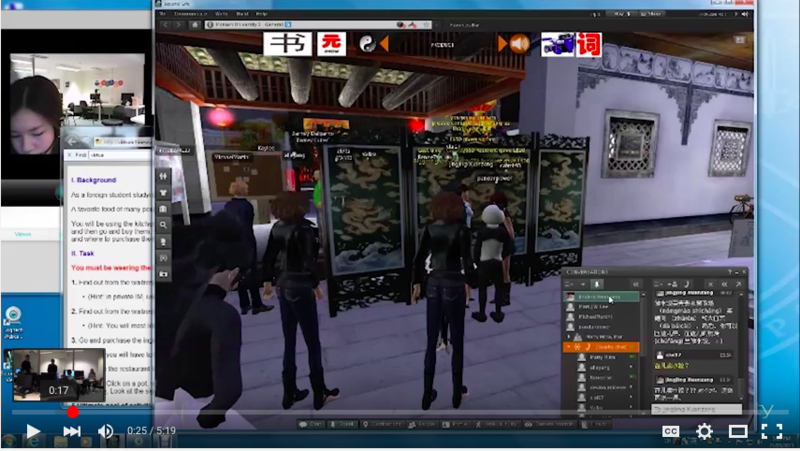 As might be expected, these Monash University students are slow to move away from their native English language when it comes to communicating with each other, but by working collaboratively in pairs, they gradually begin to use the Chinese they’ve learned to converse with the avatars and navigate the virtual environment. And they are invariably pleased with themselves when they successfully accomplish their virtual mission, increasingly confident in their ability to master the art of conversational Mandarin Chinese. Dinner anyone? Anyone hungry for Chinese food? 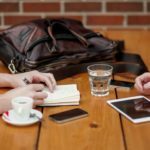 You are probably wondering what that has to do with online learning. The answer is everything if your students are learning Chinese through language immersion in a virtual world. In this scenario, students shop and dine together learning how to prepare a meal. 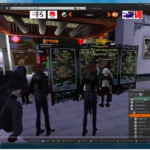 Monash University in Australia created a blended learning environment where students role-play in a virtual world to practice speaking Chinese. 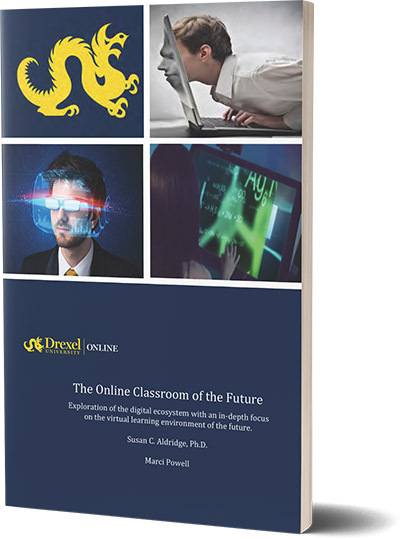 Students are either physically present in the classroom or online. However, the two worlds blend by the physical classroom having a live presence in the virtual world. Students are placed into pairs with one physically in the classroom and the other in the virtual world. Paired students communicate with each other throughout the exercise via voice and text and with non-player characters via Chinese character by text chat. Non-player characters are automated avatars scripted to give instructions or respond. The teacher is available either physically in the classroom or in the virtual world to provide support and monitor progression. 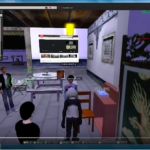 In this lesson, students participate in a tightly constructed virtual world role-play activity in Second Life. The activity is based on themes that appear in their main textbook and aimed at developing their Mandarin language communicative capabilities. Students can choose to participate in on-campus computer laboratories or from external locations. 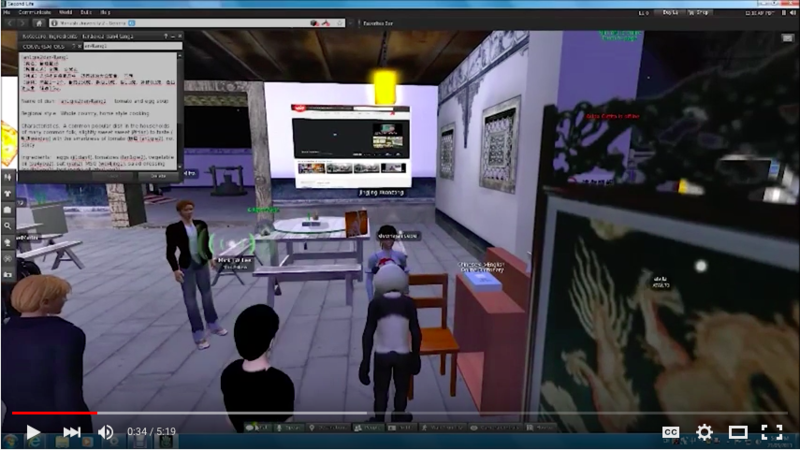 At the time of the tutorial, students log in to the virtual world and are allocated to groups of two by the teacher, who is both in the physical classroom and in-world. The objective of the lesson is for students to make a bowl of soup dumplings in the kitchen of the virtual world restaurant. This requires students to utilize a range of previously learned vocabulary, phrases, and sentence patterns to ask the non-player character (NPC) hostess of the restaurant about what ingredients they needed, where they could buy the ingredients, and how to get there. They then follow those directions and go to a traditional farmers’ market and buy the ingredients from another NPC selling fruit, vegetables, and meat. Finally, students head back to the kitchen of the restaurant to complete the various stages of the set tasks and to make a bowl of soup dumpling on virtual stoves. 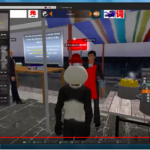 While Monash University has seen great success in this virtual blended learning environment built in Second Life, those seeking to create a similar experience should also look beyond Second Life. Linden Labs, the maker of Second Life, is expected to release their newest approach to virtual worlds in the first half of 2017. Rather than being in a giant virtual world, Sansar is built in self-contained singular virtual worlds. Even more exciting is that they are also being designed to work with VR headsets like the Oculus Rift and HTC Vive. 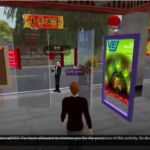 Language immersion through virtual world experiences drives a new level of student engagement. With the combination of virtual worlds and virtual reality, the applications in education for increasing student success rates and driving progression, are limitless.